South Carolina seceded from the Union on December 20, 1860. Within a few months, Mississippi, Florida, Alabama, Georgia, Louisiana Texas, Virginia, Arkansas, Tennessee, and North Carolina followed them. 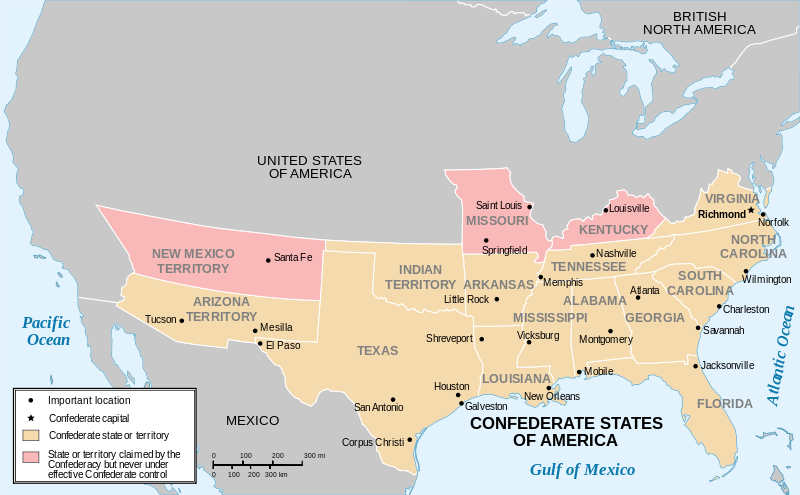 The seceded states banded together to form the Confederate States of America, led by West Point graduate, President Jefferson Davis. The stated aim of the CSA was to maintain “states’ rights” against the threat of federal intrusion by the administration of the new president, Abraham Lincoln. Though not all Southerners were willing to claim the possible abolition of slavery in Southern states as their cause for secession, it was the one “intrusion” from the federal government that concerned them, in spite of the fact that Lincoln had made it clear that his priority was not abolition, but preservation of the Union. 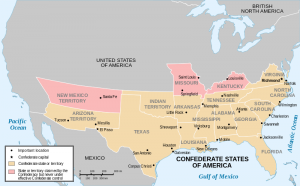 Politics and cultural sensitivities aside, Southern states seceded from the Union in order to maintain the institution of slavery and to allow their individual states to operate with less central authority from any national government. By the time the war ended in May of 1865, the Civil War had brought about two major changes to the US federal government. The first change was the growth of the authority of the federal government, which led to a drastic decrease in states’ rights. The second change was that slavery had been abolished in the Confederate States by that now more powerful federal government. States no longer had the right to individually decide the issue of slavery. When, after a century and a half of deliberation and debate, we view the South’s fatal choice to undertake a civil war with the United States, any student of military or political history has to wonder how the Southern leaders managed to make such a bad decision. What could Beauregard and his political supporters have expected when they opened fire on Fort Sumter, the Union garrison in Charleston Harbor? Clearly, they expected a surrender of the undersupplied and undermanned fort. In this they were correct, but what did they think would follow? We cannot blame Jefferson Davis and other leaders in the CSA for lacking clairvoyance, but there were well known facts that should have enabled them to draw a more accurate intelligence assessment on the prospects of war with the Northern States. Let us consider some of the important facts that were readily visible from the beginning. The one economic advantage enjoyed by the South was in greater export surpluses, but that export surplus was completely dependent on cotton. However, the South had an advantage in terms of military leadership at the beginning of the war. While most US naval officers at the time were Northerners, maintaining an overwhelming advantage over the navy of the Confederate States of America, over 300 trained army officers resigned from the US Army and received commissions in the army of the CSA. Strategically, the CSA counted on one critical advantage – it did not need to invade and defeat the Union. It simply needed to defend CSA territory. Fighting from prepared defensive positions against invading Union armies allowed the CSA to suffer fewer casualties in most of the battles it fought. When Confederate General Robert E. Lee strayed from these defensive tactics at Gettysburg, the Southern casualties mounted. While US General Ulysses S. Grant’s Union army suffered more casualties in his campaigns against Lee’s Army of Northern Virginia, Grant could easily replace his losses from the North’s abundant population. Lee could not fully replace his casualties from the more sparsely populated South. Given the obvious advantages of the Northern states, the miserable intelligence assessment on the part of the CSA that led them into battle was, in large part, dependent on two gross miscalculations. 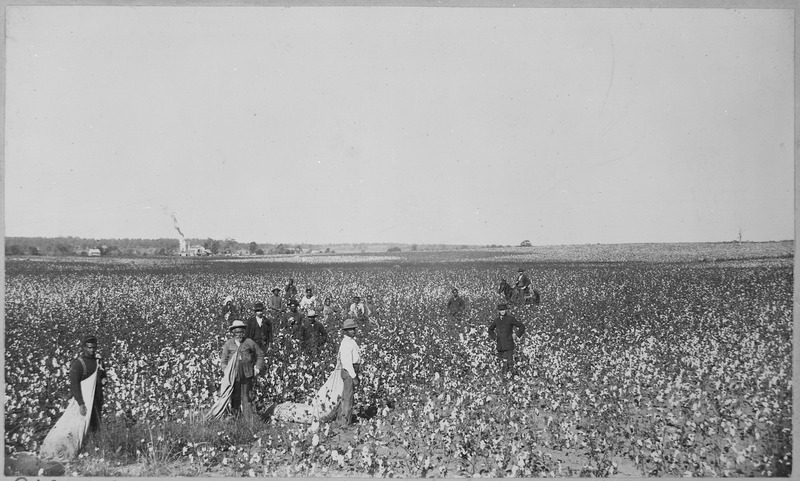 First, the CSA held the wildly optimistic assumption that France and England would come to its aid in order to obtain cotton from the South. 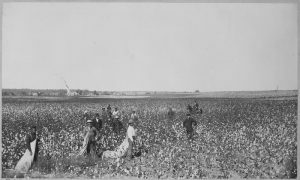 In their view, cotton was “king.” In order to force Europe to support the CSA, the South burned its cotton harvest in 1861. France and England had both invested in building a strategic cotton reserve, and when cotton stopped coming from the South due to the CSA’s temporary ban on cotton exports, Europe invested in vast new plantations in India, Egypt, and Brazil. If cotton had ever really been king, the king was now quite dead. Europe was happy to sell high quality arms to the South, but the collapsing CSA economy and the Union Navy’s blockades and captures of Southern ports prevented the South from purchasing enough weapons to match Northern production. The South’s second gross miscalculation concerned the willingness of Northerners to support a war. There were always war protestors in the North during the Civil War. Their influence was never enough to force Lincoln to prematurely halt the war. While Jefferson Davis had been acutely aware of the many disadvantages faced by the CSA, he and his supporters allowed their passions to lead them to gross miscalculations. Passions and emotions have no place in intelligence analysis. Stick to the facts. Romantic delusions will not win on the battlefield. Speaking of romantic delusions, in another article, we will consider US intelligence failures in the Korean War.